The labyrinth is a curious feature in architecture. It attracts much attention, not only in the mythical sense, but also as a practical construction. People throughout the ages and of all ages have been fascinated by this symbol of difficulty and confusion. The enchanting perplexity – seen as a psychological entity – can be placed in the Fourth Quadrant of the quadralectic outlook. The position has to do with the multitude, pointing to a world where too much is seen to understand, where visibility becomes fluid. The Fourth Quadrant is typified by the saying that one cannot see the forest from the woods. The labyrinth in its original Egyptian-Cretan form, is the very architectonic expression of quantity of space, leading to the problem of ‘too much’ visibility and subsequently to a new invisibility. The roots of the myth date back to Egyptian antiquity, and in particular to the mortuary complex near the Pyramid of Hawara, built by Pharaoh Amenemhet III (1817 – 1772 BC) in the 12th Dynasty (Middle Kingdom). The Labyrinth had twelve covered courts, with about three thousand rooms. It figured as the prototype of a place, which was so intricate that one was bound to lose its way (fig. 47). Quantity acted as protection for grave robbers and profaners, aiming at the valuables stored for the afterlife. Fig. 47 – A map of the western part of the Egyptian labyrinth as it was surveyed by Flinders Petrie. He discovered the ruins in 1888 and reported the outcome of the archaeological diggings in his book ‘The Labyrinth, Gerzeh and Mazghuneh’ (1912). The mortuary temple of Amenemhet III was mentioned by Herodot (living in the fifth century BC) and was since quoted in literature as a specimen of a ‘labyrinth’. DEEDES (1935) described the history of the labyrinth and pointed to Egyptian seals in the Old Kingdom (around 3000 BC). These so-called ‘palace-signs’ depicted a funeral temple in a stylistic way. The Egyptians were highly skilled engineers and familiar with the building of an intricate pattern of irrigation channels to lead the water of the Nile to the agricultural areas. The same observation holds for the cultural and architectural realm of Mesopotamia. Archaeologists found some spiral depictions, which were known as ekal tirani or ‘Palace of the Initiated’. They symbolized the intestines of sacrificed animals. Only initiated priests knew their meaning. 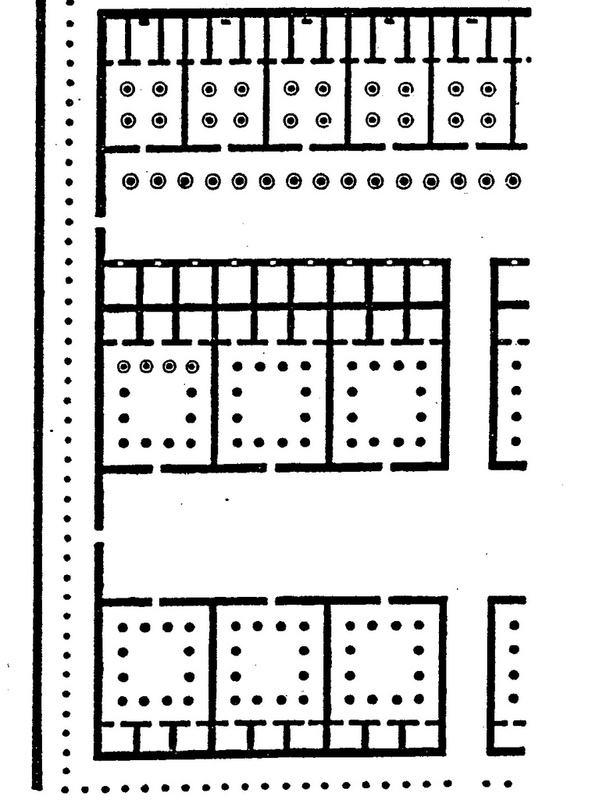 The relation with a labyrinth was suggested by German historians at the beginning of the twentieth century (HOMMEL, 1919). They pointed to the (anatomical) associations of intestines and liver as a means of soothsaying. The spiral mess of intestines represented – in a wider sense – the underworld. The long, elaborate journey along a spiral is a basic motive of life and seems to warrant the incorporation of the structure within the mental picture of the labyrinth (fig. 48). 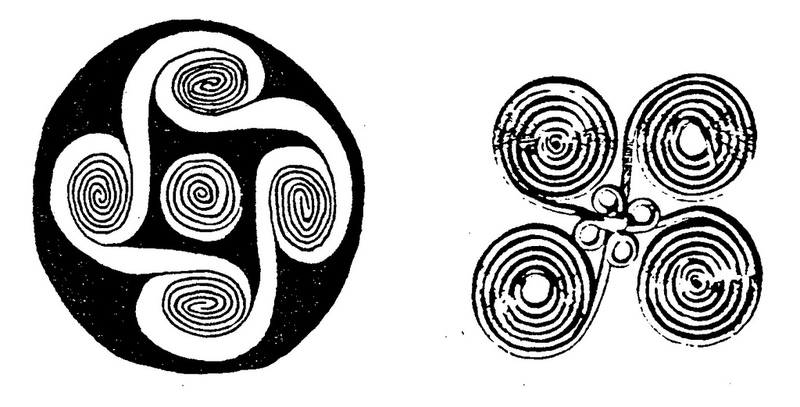 Karl KERENYI (1950) illustrated many examples from all over the world to identify the labyrinth as a mythological idea, associated with spirals. Fig. 48 – The motive of the spiral is often qualified as a pseudo-labyrinth. The long and continuous line seem to warrant its inclusion in the psychological understanding of the labyrinth. To the left: Boeotian fibula, ninth – seventh cent. BC; To the right: Design from a Mimbres Bowl (New Mexico), eleventh-twelfth century AD. 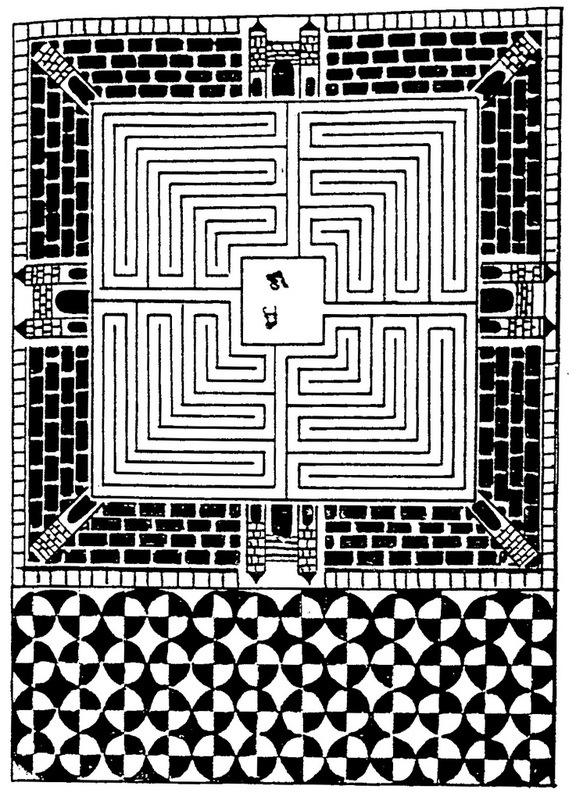 Further historical fame of the labyrinth came from the isle of Crete (fig. 49). This Mediterranean island was known in the Greek mythology as the birthplace of the supreme god Zeus. It also figured in mythology as the place where Theseus killed the Minotaur. This monster, with the body of a man and the head of a bull, lived in a labyrinth. The administrative and religious centre of King Minos in Knossos was built in the early second millennium BC. The Minoan civilization subsequently reached its heights in the seventeenth and sixteenth century BC. The eruption of the volcano on the nearby island of Thera contributed to the demise of this highly developed civilization. Fig. 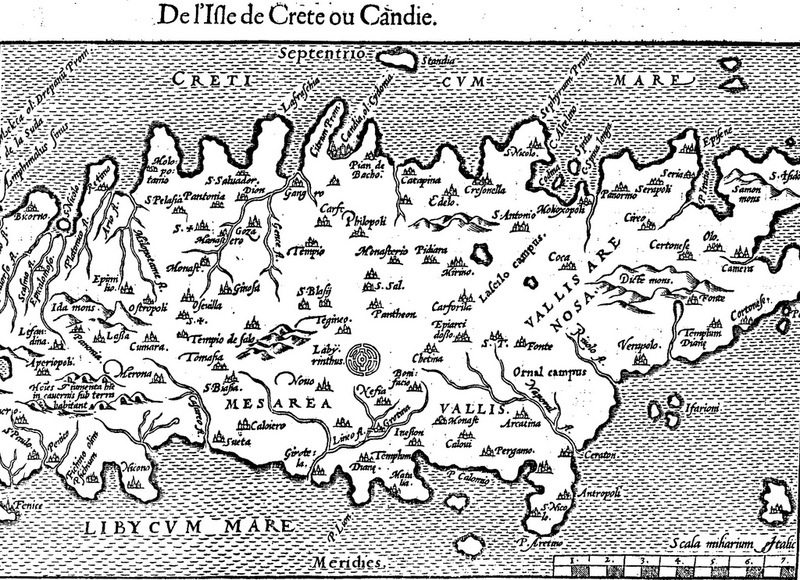 49 – The location of the Labyrinth is given here on a map by Sebastian Munster (‘La Cosmographie Universelle de Tout le Monde’, 1575). The excavations at Knossos – by Arthur Evans (1851 – 1941) from 1900 onwards until 1931, with an interruption for the duration of the First World War – provided a further strengthening of the idea of the labyrinth. 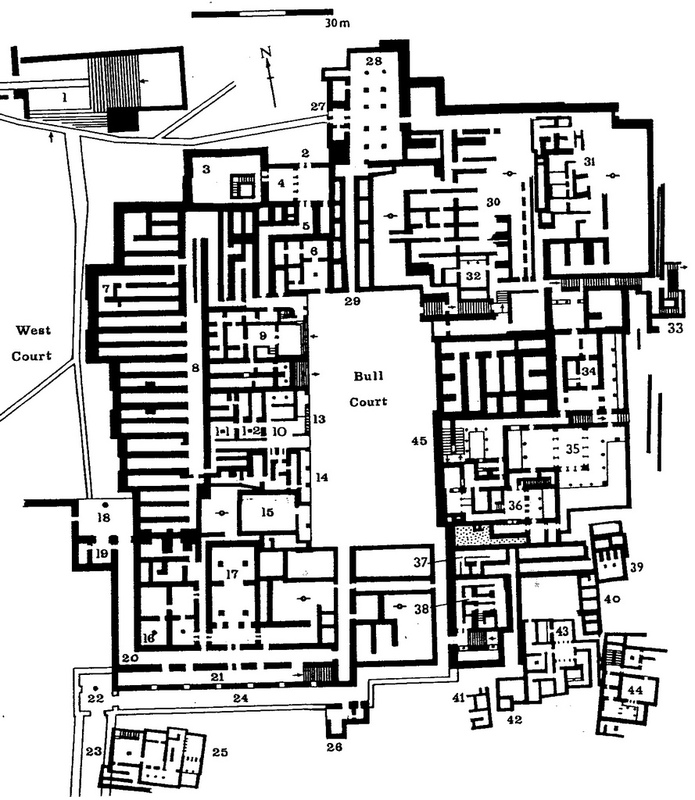 He interpreted the site as a large palace (‘The Palace of Minos’), with a central court (fig. 50). Later interpretations (by CASTLEDEN, 1990) moved the emphasis to an interpretation as a temple complex with sanctuaries and ceremonies, including the famous bull leaping ritual on the Bull Court. Fig. 50 – The Minoan building complex at Knossos (Crete) was also known as the Labyrinth. This reconstruction of the ‘ground-floor’ by Rodney Castleden (1990) put the emphasis on the use of the buildings as a temple complex. Most buildings have, in Castleden’s interpretation, a function as sanctuary or shrine, like the Throne, Snake Goddess and the Double-Axe Sanctuary. Workshops and service quarters are situated in the northeastern corner of the complex, while the majority of the storerooms are on the western side. The original interpretation of Arthur Evans pointed to a palace (of King Minos). 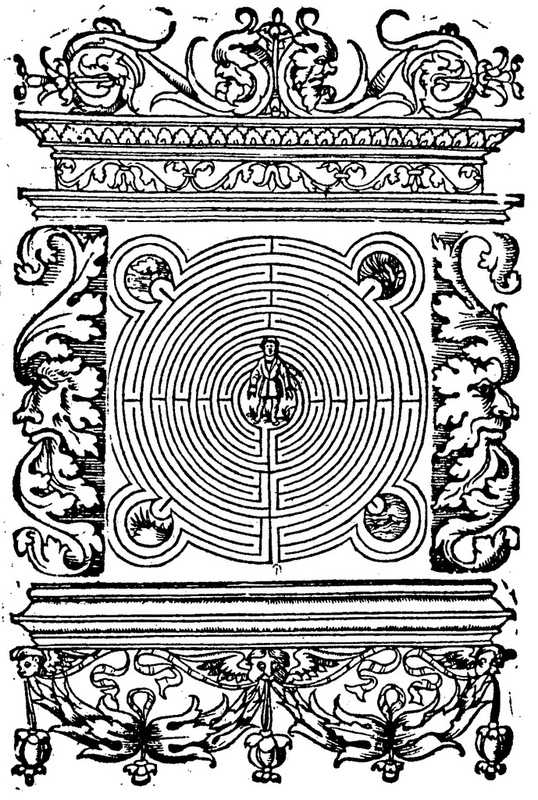 The meaning of the labyrinth as a symbol of ‘the difficult path’, comparable with life-itself, found its application in many ways and it would lead too far to cover this subject within the given space of this book. The best overview can be found in the standard work of Hermann KERN (1982). He collected a great number of examples of labyrinths from all over the world and throughout the ages. A somewhat dated, but still informative overview is given in MATTHEWS’ book ‘Mazes and Labyrinths’ (1922). Wiktor DASZEWSKI (1977) provided additional material of labyrinths in Southern Europe and Northern Africa. 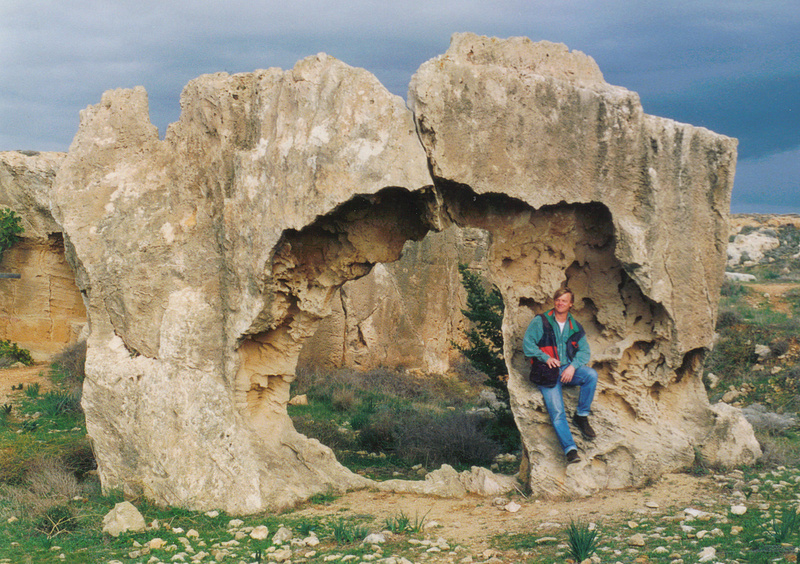 He was involved in the excavation of the labyrinth mosaic in Kato Paphos (Cyprus). The mosaic at Paphos dated from the middle of the third century AD with restorations after earthquakes in 332 and 342 AD. Greek craftsman hired by the Romans made the mosaics in those early ages of our era. The time-consuming labor, using many small parts (tesserae) to create a new reality, is very much akin to a labyrinthine journey through the mind. The labyrinth in the palace of Kato Paphos (Cyprus). Pl. 2 in: DASZEWSKI, Wiktor A. (1977). Nea Paphos II. La mosaique de Thesee. The King’s Graves at Kato Paphos, Cyprus. (Photo: Marten Kuilman, November 1994). The mosaic labyrinth in Orbe (Switzerland) was part of a roman villa (fig. 51). The mosaics dated from the first centuries AD and were discovered in 1845. A young man and a bull (Theseus and the Minotaur) could be seen at that time (in the nineteenth century) in the central part. These details were since lost when the mosaic was rediscovered in 1930. The labyrinth is depicted as a city with a wall and (twelve) towers. Other mosaics at this same site (Boscéaz) show thirteen medallions with illustrations of the planets and the sun (Sol in a quadriga). An even more elaborate example of a Roman mosaic with a labyrinth was found near Salzburg (Austria; now in the Kunsthistorisch Museum, Vienna). Fig. 51 – The labyrinth, as reconstructed from a mosaic in a Roman villa in Orbe (Switzerland), is depicted here as a city with walls and twelve towers. No entrance nor an exit can be distinguished on this decorative representation. The labyrinth went out of fashion after the collapse of the Roman Empire (at the end of the fifth century), with its heydays of mosaic floor coverings in the early centuries of the Christian era. However, the Church accepted the mosaic as a means of sacral decoration and carried on with the pictorial tradition. The San Vitale in Ravenna (build between 546 – 548 AD) is, in that respect, a true statement of the young Church. The round labyrinth in the San Vitale is situated in one of the sectors of the central octagon under the cupola. It seems that this labyrinth is not dated from the sixth century, but from the sixteenth century. The floor of the church was raised between 1538 and 1584 due to constant flooding and the early Christian mosaic floor was replaced. The start of this labyrinth is in the center and arrows point to the center of the octagon (the symbol of rebirth). The glorious (r)entree of the (unicursal) labyrinth had taken place some four hundred years earlier in the mediaeval Gothic cathedrals and churches of France. Many examples are known and described (KERN, 1982). A lesser known example is given here in the labyrinth quaternity on a Medieval tile at Chalons-sur-Marne, depicting four labyrinths of the classical type (fig. 52). 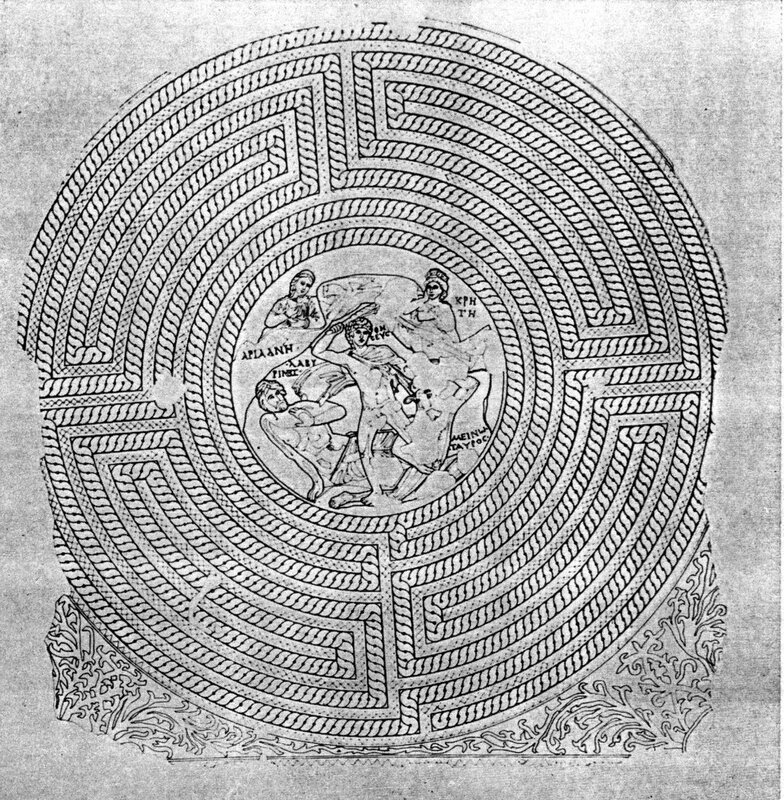 Here we see a unique expression of the relationship between the idea of the labyrinth – as a symbolic way to the essence of life – and the four-fold (quaternity). Fig. 52 – This set of sixteen tiles from the Toussaint Abbey in Chalons-sur-Marne depicts a labyrinth quaternity. The tiles make up a square of fifty by fifty centimeters. The center is a square with four triple pillars pointing towards an empty midpoint. Four (classical) labyrinths fill up the space of the four quadrants. The central quaternity is encircled by a band of eighth bird-like or griffin-type of animals with a spiral decoration. The symbolism of the Fourth Quadrant – as a search for unity in multiplicity – is pushed here to its limits. The unicursal labyrinth designs of French cathedral floors peaked in the thirteenth century, with the labyrinth of the cathedral of Chartres probably as the best known and most often reproduced example (the ‘Chartres-type’ labyrinth). Other church labyrinths did occur in the cathedral of Sens, Arras, Amiens, Reims and Auxerre. Simpler forms could be found in Bayeux, Mirepoix, Toulouse, Poitiers, Genainville (Val d’Oise) and Saint-Euverte d’Orleans. Their precise function is not known – other than a symbolic journey through life or a means of contemplation. Fig. 53 – A woodcut of the labyrinth and the four elements as given by Guillaume de la Perriere in his book ‘Le Theatre des bon engins’ (Paris, 1539). The emblem has a symmetrical outlay and the labyrinth is unicursal (Chartres-type). The four elements (fire – air – earth – water) are incorporated in the trajectory. 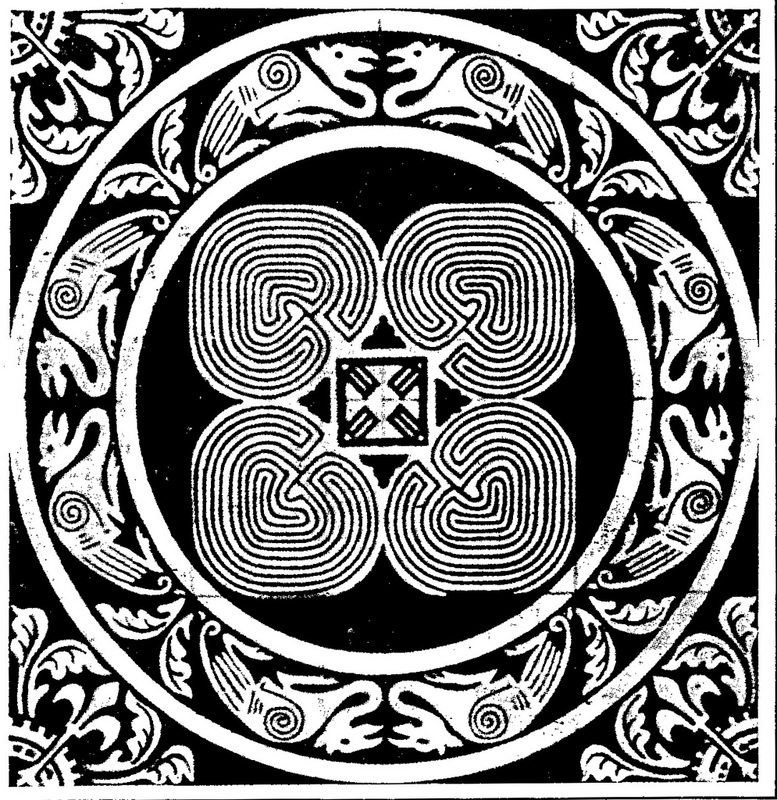 The French polymath Guilllaume de la Perriere (1499 – c. 1565) made a relation between the labyrinth and the four-fold. He gave in his book ‘Le Theatre des bon engins, auquel sont contenuz cent Emblemes moraulx’ (Paris, 1539) an emblem (no. 35) with an unicursal labyrinth and the four elements (fig. 53). De la Perriere contributed to such dualistic issues like the relation between male and female and the poor and the rich. These themes were also explored by Gratien du Pont in 1534. The continuation of oppositional thinking brought him into the world of the ‘numerological’ four-fold. His book ‘Considerations des quatre mondes, a savoir est: Divin, Angelique, Celeste et Sensible’ (1552) was written in four hundred quatrains (sixteen hundred lines) and can be seen as a celebration of the number four. In his book ‘La Morosophie’ he used emblemata to support the moralistic text in French with Latin tetrasticha. The interaction of word and image in a printed book was not altogether new in printing, but it suited the ‘extended division thinkers’ in a particular way. ELKINS (2003) pointed to the feeling of meaning, which is generated in the mingling of word and image, emblem and picture. The theme of the four-fold was further explored by a medical doctor from Lyon named Symphorien Champiers (1471 – c. 1539) in his ‘Liber De quadruplici vita’ (Lyon, 1507). He studied in Paris and Montpellier and published ‘Neoplatonic’ work while serving the Duc of Lorraine. There is in his work, just like that of his contemporary de la Perriere, no real break-through to a four-fold way of thinking, but a sympathy and attraction towards the numerological presence of higher division is clear. Penelope DOOB (1990, p. 40/41) pointed to the important difference between the classical and modern labyrinth. The former was unicursal (one-way-only, single line) while the latter were multicursal with a need for choice. The choice between left and right became – in the context of lower division thinking – a delight in its own right. The popularity of mazes grew rapidly after the pivotal year 1500, mainly due to the popularity of garden design. The word ‘maze’, although pointing to the multicursal version, became an equivalent of the Latin labyrinthus. The gardens of Hampton Court (Herefordshire) and St. James and in the Tuileries garden in Paris provided – among many more – examples, in which the new spirit of ‘deliberate confusion’ was applied. The importance of the labyrinth for (quadralectic) architecture can be found in the four-fold interpretation of the phenomenon. The overall impression is one of movement: a labyrinth requires movement. It can be seen to epitomize the constant cyclic movement in a communication. The road through the labyrinth also requires stamina to follow the course. For those who enter the project, either as a person to let things happen (unicursal) or as a decision taker (multicursal), there is – as a reward – the feeling of meaning. There might even, for some, be the success of reaching the center. The subject of the labyrinth – as an architectural structure with a deeper meaning – is still wide open, but the main characteristic is the Celebration of Multiplicity. It is, as suggested, a Fourth Quadrant entity, dealing with the specific difficulties of the visible invisibility and the relation between the trees and the wood. Artist of all ages – from prehistoric to modern times – have been intrigued by the true character of the labyrinth and have tried to follow Ariadne’s chord. And then again, as Theseus found out after slaying the Minotaur, even the victory of finding the center does not guarantee success. Just one error, forgetting to change the sails from black to white, can bring disaster and made the whole effort fruitless. The phenomenon of the labyrinth as a mental entity is still a living reality in modern architecture. Any building, if it wants to appeal to a sense of beauty, has to include the mystery of the unknown. Many solutions have been found over the years to incorporate the secret of the unknown within the character of a building. The concealed doors in the Egyptian pyramids are always explained (in modern popular literature) as a remedy against ‘grave robbers’, but it is equally possible that the phenomenon was part of a deliberate architectural plan to include the invisible into the design. Another mean to transpose the mind of the observer into the realm of the labyrinthine is the introduction of the multiplicity in a material form by repeating certain elements or motifs. The ‘classical’ labyrinths, like the mortuary temples of Amenemhet III and Ramses III in Egypt and to a lesser extent in the palace/temple complex of Minos at Knossos (Crete), were doing just that: giving the eye (and mind) no rest in the visible. The visible invisibility, which is identified as a hallmark of the (quadralectic) Fourth Quadrant, has been introduced in the labyrinth and its presence remains an important element in architecture up to this day.